This weekend was fix it weekend. I had gotten a new battery for the electric screwdriver and set about tightening screws on everything that even looked distantly loose. After putting up the new clock in the Kitchen, badly I might add but don't look too closely, I did an inventory of all of my collected bits. 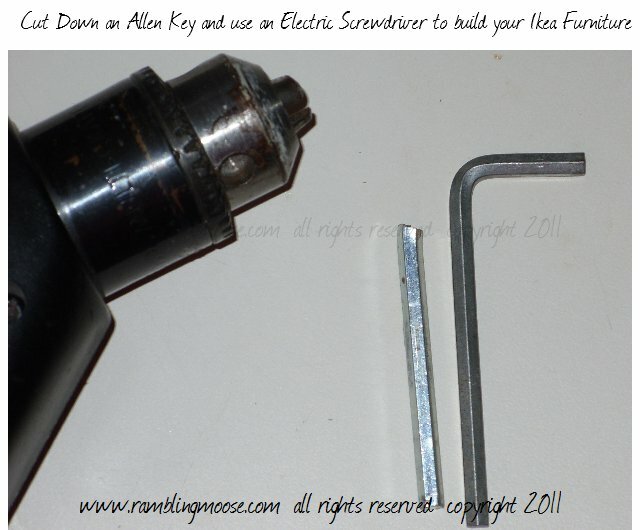 The screwdriver is a useful tool, but can be a bit specialized. After all tiny screws will get stripped with an electric screwdriver, and you just may not have enough torque in the smaller ones to "oomph" that screw into place. I had realized that I did something, years ago, that was novel and needed to be shared. We have all put together that flat-packed furniture at one point or another, or used it and wondered why people bother using those silly little hex-keys to assemble them. They can be literally painful to build, blister inducing, and frustrating when you realize you spent the entire afternoon tightening down yesterday's work because you didn't put a drop of wood glue into the threads to make it stay put. Usually there are some sort of fitting that the screws will go into, wood on metal can pull apart easily if you have a particle board piece of furniture. Typically the better pieces will have a threaded nut with a back on it to spread the compression energy on a wider area to hold things better, then the allen screw will tighten down into that. They're time consuming, and I found that there was a simple "hack". Take the allen wrench and cut it in half. I cut mine right at the elbow of the 90 degree joint, and now I have a bit to put into the electric screwdriver. Once I mount the allen wrench bit into the hole, I can use the electric screwdriver to tighten everything up quickly. I've never heard of anyone doing this but I've done it many times to build furniture or tighten up the bolts on the Poang Chairs that I'm so fond of. As we say around here it "Works like a Champ! ".